Our October book pick was donated by the lovely publicists at Hachette. 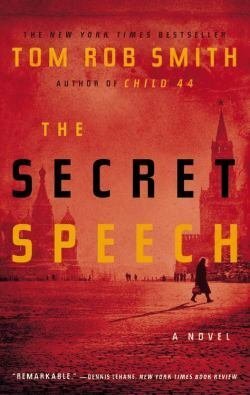 I wasn't aware that THE SECRET SPEECH was the 2nd in a trilogy (that begins with CHILD 44) until I read the author interview at the end of the book. Short Summary: Stalin is dead and the new government issues a secret speech that condemns the brutality of his regime and those who worked for it, including our protagonist Leo. At the same time, one of the victims of Stalin's secret police starts hunting down former agents in revenge and ends up kidnapping Leo's adopted daughter in a plot to make him suffer as much as she did. The Group's Verdict: We were divided - some thought the novel was just too violent for their tastes and didn't finish while others were quite impressed by the plot and character development of this historical thriller. I personally had a hard time putting this one down and am looking forward to picking up the other books in this series (including the upcoming A NEW WORLD, due in February 2011). Up Next: The book has not yet been chosen for the November meeting, but since I'll be in the US, I won't be able to attend anyway. I should mention that my choice for our September meeting was THE HUNGER GAMES. Everyone enjoyed it immensely and immediately wanted to start CATCHING FIRE. Reactions to CATCHING FIRE were mixed though, with several members abandoning it after just a few chapters. I don't know if this had any bearing, but after I listened to Child 44, this book was a huge disappointment. I felt like it had an identity crisis, and the protagonist seemed to lose his soul. If you didn't read it as a sequel, then I don't know. Perhaps the bar wouldn't be quite as high? This doesn't seem like the kind of book that I would normally be interested in, but your reaction to it gives me pause. I haven't read Child 44 either, but have read some really good reviews, so maybe I will have to try these. I am glad to hear that you enjoyed it so much! I have Child 44 so now I'm excited to read it! I really want to find an IRL book club! This sounds pretty interesting! I've read mixed reviews of this book. I own it, but I haven't read the first one yet so I don't know when I'll get around to it.